It’s from Pablo Neruda’s “The Great Tablecloth,” a poem that describes the pain and inequity of hunger. They’re fitting words for the UNH nutrition major and Hamel Scholar who started Swipe It Forward, a program that provides free meals for students who can’t always afford to eat. But for Davidson the road to fighting hunger took a couple turns. Davidson arrived on campus in 2013 interested in sports nutrition, not food insecurity, and she remembers feeling initially overwhelmed by college life. But in four years, she has gone from a nervous first-year student to a self-assured graduate with a clear view of her future. It’s a path that illustrates the transformative power of the university’s singular faculty and undergraduate research opportunities. "Reach out to faculty at UNH. Going to office hours and asking questions when I didn’t understand something was instrumental to my success. Don’t be afraid to get to know your professors. That has had a lot of impact on my life." It all began with the College Health and Nutritional Assessment Survey, an ongoing project that’s been collecting data on the health of UNH students for 10 years. In her first year, Davidson got involved helping with bone health screenings. Then, in her sophomore year, she was given the chance to design a research project based on any aspect of student nutrition and health. It was the perfect opportunity to explore a problem she encountered as a volunteer at a mental health center in her home state of Connecticut delivering locally grown food to people on public assistance: food insecurity. 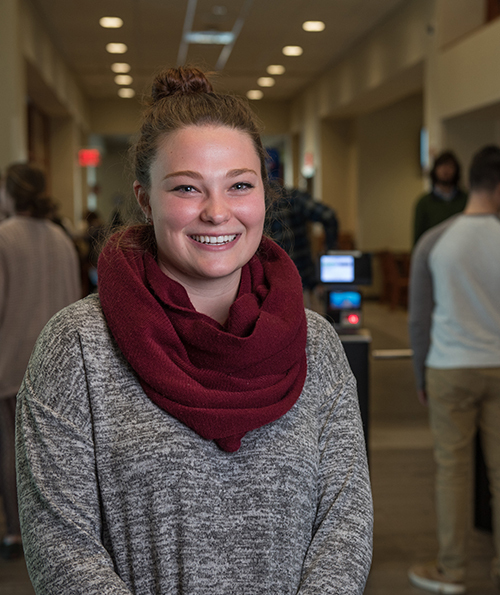 Davidson's project led her to conduct a campus-wide survey, supported by a grant from UNH's Hamel Center for Undergraduate Research, during her junior year. The results were surprising: Of the nearly 1,000 students who responded, 25 percent reported being food insecure, meaning they were without reliable access to enough affordable, nutritious food. These students, Davidson says, are more likely to experience headaches, lethargy and an inability to concentrate — all due to a lack of proper nutrition. Armed with the survey results, Davidson took action and, with the help of UNH faculty and administrators, created Swipe It Forward. It was an experience, she says, that “changed everything.” Now, students who qualify for the program can use their meal cards or finger scan — just like their food-secure peers — to access meal credits that have been donated to the "swipe bank." This summer, Davidson is volunteering at End Hunger Connecticut, where she's helping administer a federal program that feeds low-income children when they’re not in school. Then she'll be off to Tufts University, where she'll work toward a Master of Science in food policy and applied nutrition. She'll also speak at the American Public Health Association's annual conference in November. Davidson hopes one day to drive policy changes that impact food insecurity at the college level. Improved nutrition, she says, will lead to better grades, fewer dropouts and brighter futures. Learn more about how UNH nutrition majors are applying their research and making a positive impact.